I call the full moon in May the Honey Moon. In pagan lore the Summer Prince and the Maiden of the Moon meet, and find delight in each others company. And so, this is known as the Honey Moon, a time for love. In many cultures and beliefs this is seen as the time in the Wheel of the Year when the Goddess in her mature aspect of Queen of the May is coupled with the God in his mature aspect of Summer King. Together they reign over the peaceful season of growth and abundance. 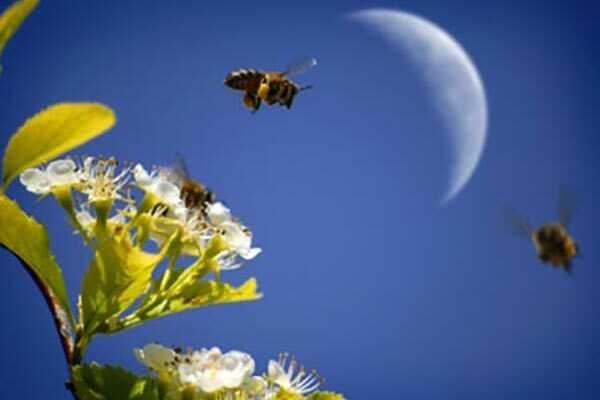 Even today, many weddings and hand fastings are performed during this season of Beltane and are celebrated by drinking a liquor made from Honey. According to the ancient Greeks, marriages consummated during the full Moon are most prosperous and happy. This moon is also known as the Rose Moon, Hot Moon, Planter's Moon, Milk Moon, and the Algonquin Indians called this one the Strawberry Moon since it was a time to gather the ripening strawberries.